Canikur® Pro is a tasty choice specially formulated for dogs containing a probiotic, special clay, and the unique ingredient BioMos®-C to support their gut function. It can be used as a nutritional complementary support for intestinal disorders or during periods where the natural intestinal flora may become imbalanced, for example because of stress (travel, change of diet, shows, competition, lactation, weaning, visiting the vet) or because of medical treatment such as antibiotics. BioMos®- C BioMos®-C helps the good bacteria in the gut grow and flourish. Unique to Canikur® Pro, dual action BioMos®-C helps boost the chances of maintaining a healthy gut environment. It acts as food for friendly bacteria encouraging them to grow and multiply and blocks bad bacteria from attaching to the gut wall surface. Soybean oil, inactive yeast, hydrolysed vegetable protein, glucose, sodium chloride. Additives: Enterococcus faecium (NCIMB 10415) 1707 E: 5 x 1011 cfu per kg, montmorillonite E 558: 22%, natural identical artificial meat flavor. 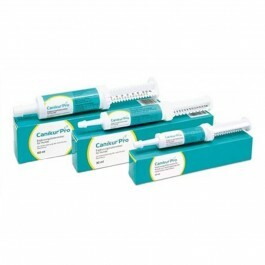 Most dogs love the tasty meat flavour and will eat the paste straight from the syringe. A few dogs may not eat Canikur® Pro spontaneously, so try mixing it with their normal food. Underlying gut problems It is important to seek advice from your vet if your dog is suffering from an upset tummy, especially if he is off his food, diarrhoea and/or vomiting are not resolving, or he is simply "not himself", .